After reading much literature on the topic of retirement, financial independence and various sub discipline on the topic I lean closer to the view that what people are looking for is a more balanced life. Less stress, more family time, doing work but not at such a frantic pace, not a constant worry about money. With this regard, financial independence is meaningful to pursue, but could ultimately proved challenging for sum to achieve given their circumstances. Given that you are above middle income, this pursuit could be far easier than others. Pursuing a scheme where we work in reduced scope, to enjoy the balance between purposeful work and life, or less stress work and purposeful might be more practical. Thus Semi-Retirement might be a more applicable and useful scheme for you. However, this financial independence scheme is not without its challenges. Today, we sought to explore the financial numbers behind semi-retirement, and the other qualitative considerations. Semi retirement is not a new concept. People have been doing this for some time. It is also often explored as a subject. We think the definition is placing a balance between what you demand about your life and the necessity of having a job. Each of our definition could vary but if I were to label it, I would lump them under reduced work or semi retirement in this article. To me, if you are doing some form of paid work, you are in the semi-retired mode. In these kind of work, you do earned less, but the reduced amount that you earn may give you an adequate lifestyle. To provide security, you have been prudent to accumulate wealth so that the wealth can supplement your reduced work income over the period of time. Now lets look at the different phases in your life that you will progress in semi-retirement. The timeline for Semi-Retirement Looks very close to that of Coasting Financial Independence, a scheme of financial independence that I have written about in the past. The first part of you life is spent learning and training in some competency that would be useful when you come out to work. The second phase would be where you focus on accumulating wealth aggressively. This would depend on the plan. For some, they prefer to form the family, have children and then lengthen the time they work to 45 years. The next phase would be when they accumulate adequate wealth that allows them to partially fund their annual expenses. This allows them to work in a reduced scope, in another kind of job. This gives them more time to spend with their family, still contribute, participate and work in a professional capacity. The last phase is a full retirement. This is usually when you cannot find reduced work, or health wise, it does not allow you to work further. Usually, in this scheme, this is later than the traditional retirement age of 65 years old as your frame of mind is that you are OK to work. Semi-Retirement is appealing, primarily because the sum you require to hit the semi-retire milestone is much less than the traditional retirement, or even financial independence. The amount you need depends very much on the ratio of annual expenses is covered by your reduced work. When is it safe to say you are ready for semi-retirement? Depending on different levels of work that you choose to do, your semi retirement income could cover the full $36,000, $24,000, $18,000, $12,000 or $0 of your annual expenses. What is left over is the amount that you would need to tap your portfolio to provide the residual cash flow to meet your current expenses. I have laid out 3 different initial withdrawal rate (first year rate, after that rest of the year increases with x% of inflation) of 3%, 4%, 5% that you could potentially spend down your wealth and the corresponding wealth that you need to accumulate in the table above. If the cash flow from the wealth portfolio you need is $0, you could take a job that is less stressful or you have more interest in, but does not pay as well. Usually, people wish that they do not to lose too much of the opportunity cost because you were trained in this particular area. You would earn a certain adequate amount of wealth in your main competency before making the transition to semi retirement. This is pretty close to coasting financial independence. If your cash flow you need is $12,000 to $24,000, your wealth required will depend on your portfolio withdrawal rate. At 4%, it could range from $300,000 to $600,000. For those who are more adventurous, they might pick a withdrawal rate of 5%. The amount of wealth they need is $240,000 to $480,000. The amount you need is much smaller. This means you have the potential to get there much earlier. However, it is suitable for you if your semi-retire work situation can scale up and down. For example, some of you work in the software engineering field, the teaching field that can switch to freelance software development or freelancing tuition. The amount that you earn depends on your willingness to do more or less jobs. When your portfolio is under stress due to poor markets, you can take on more jobs so that the income pays for more of your required annual expense. To accommodate a 5% withdrawal, you would have to allocate more to equities or financial assets that provide higher expected returns. Financial assets that have higher expected returns, tend to be more volatile. If returns and your portfolio is volatile, to ensure you withdraw from your portfolio, your spending have to be variable, spending less during years when the portfolio is taking a hit, and taking part of the cash flow from the good years to save for those lean years. This is suitable for those with the agile minds, who prioritize the balance of work and life. For those that are more conservative, they can choose to build up more wealth, and use a lower initial wealth withdrawal rate of 3%. In this way, they have more peace of mind of balancing a job that they would not have to be forced to scale up your reduced work. If there is a poor market, because they draw down less (3% versus 4%), the withdrawal rate based on a weaker portfolio would be closer to 4-5%, which may be the norm of many. People tend not to remember the #2 aspect, which is that your wealth needs to grow enough so that when you are completely retire, the money is adequate for spending then. Some time back Zack from 4 Pillars Freedom hit that epiphany that if you do part-time work and make half of your annual expenses through earned income, you need less. His research is based on 100% investment in the S&P 500 (which you can do through an exchange traded fund). This is a 100% equity strategy, and from what I explain earlier, the expected returns are likely to be higher, and so are the portfolio volatility. Instead of saving 25 times your annual expenses, the research shows that you can make do with 15 times your annual expenses. This may come close to the figures I presented where you need $600,000 at a conservative 3% withdrawal if your wealth portfolio provides you with 50% of your annual expenses. In his article on the various schemes of retirement, Michael Kitces attribute that for semi-retirement you pushed back the official retirement age to much later. Thus you have a longer period of accumulation. When your official retirement is later, and you have earned income from your semi-retirement work, you need to draw down less, which is more comforting on your wealth portfolio. This aggregates to less cash flow drawn down from your wealth allowing it to grow. I do contend that this very much depends on how much percentage of your annual expenses you need from your wealth portfolio. If you need more, then its hard for your portfolio to grow, despite the longer accumulation period. Ultimately the semi-retirement or career pivot nature matters. The lowest risk is to sustain your annual expenses by your reduced work. This is Coasting or Barista FI. If you cannot have that, trying to aim for a 3% withdrawal and your annual income from retirement job to cover 50-75% of your annual expenses. You would also have to consider this with the nature of your job nature chosen. I ultimately think the semi-retirement way of life is the most realistic because people don’t just retirement and stop working. People tend to work on something not for the money but for interest. Usually, these interest work area results in income. Of course, for some people that never happen efficiently and they couldn’t earn well from it. The financial requirement for semi-retirement is leaner, and in truth, you need to have enough confidence that this amount of wealth is enough, you have confidence you can have a sustainable reduced work to meet the expenses. 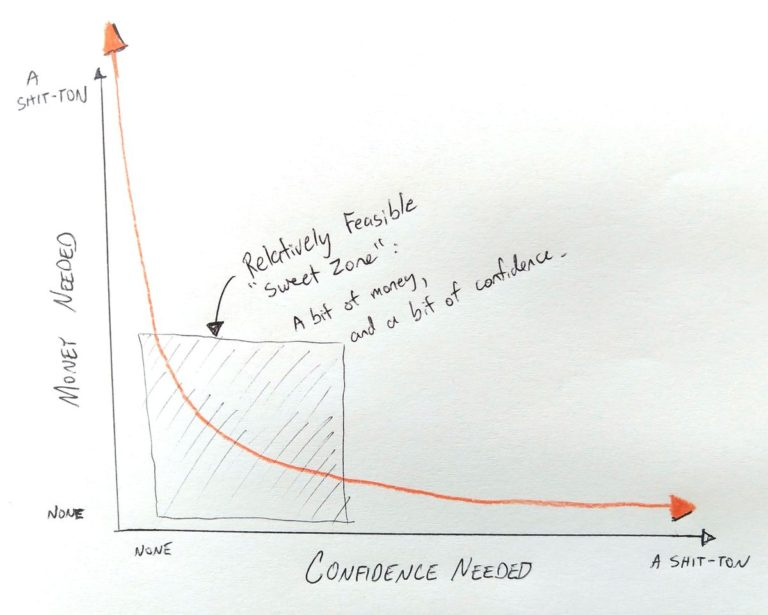 The image above is from Mr Money Mustache post that Money and Confidence are interchangeable. He gives the notion that for most that saved enough to hit financial independence, they are productive enough to even earn in retirement that they continue to earn money from it. So thus, that is not retirement but some form of semi-retirement technically. I do not agree that there are only 2 parameters. From what I observe, you can call it confidence in your ability to create a business, in a skillset that wasn’t your main vocation, I called it the level that you security fail-safe if things don’t go according to plan. Most of us have enough wealth so that when we get fired from our job, we can depend upon it. In semi-retirement, if we do not have enough work, we need to depend on having enough money to provide the cash flow to pay for our annual expenses. Some people need absolute security. I think if that is the case, semi-retirement is probably not suitable. If you do not need much security, my suggestion is find someone to look through your wealth numbers, your plan for semi-retirement just to ensure its validated well as fundamentally sound from the numbers perspective. If you have a simplistic view of how much is enough, then you may have high confidence this will work out, despite the reservations of your peers. If you think things out too much like me, you may never develop that secure feeling of taking the plunge. Each of us have our own balance between how much you have in wealth, how confident you are and the level of security you need. Thus, it is not always that we can say you can semi-retire. It becomes easier if the wealth numbers checked out to allow you to though. 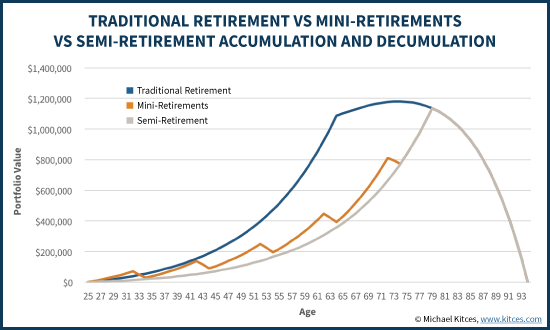 The biggest danger of early retirement, retirement is during the last years of accumulation, and early years of spending. If instead of doing a full switch to not working entirely, you ensure that you have some vocational or other kind of work to reduce your working hours, still have earned income, it could ensure that you do not draw down your wealth portfolio too aggressively. In a negative sequence, your portfolio can have a better chance to return to the original amount. In the event it is a positive sequence, your portfolio would have accumulated more and quite possibly you could afford to work less hours in your semi-retirement. This is only valid if this work and life balance suits you. One of the seldom talked about aspect of early retirement is the internal conflict that some have about their relationship with their job. For some, they really enjoy a few aspects of their job. For most of us, our parents or we as individuals spend enough resources to put us through school. Then we went through the process of being the grunts at work, getting promoted. Most of all there are particular satisfaction in fulfilling certain projects, business success. Some folks missed that aspect, the interaction with co-workers, customers. Working in a different capacity might allow you to mediate between having purpose in your work, more time for yourself. One of the main downside of semi-retirement is, in truth, not every industry allows you to do that. Some industry do not have a culture of having that option, some do. When your vocation do not allow you to do that, you have to be retrained to bring your portable skills to another industry, hope that the entry level work do not have too much downside in terms of stress and hours work. You might end up in a situation where you don’t get more time, less stress and also get paid less! The opportunity is that we hope that as the country become more accepting to freelance work, allowing some of your competent staff to work by the hours, or seasonal would be more realistic. Some years ago, I do know of this acquaintance that is in his 50s that has a lot of stories to tell from his employment past. I asked him how is it that he is able to work in fields that is so varied throughout his life. He shared with me that firstly, you got to be quite a nice chap, not just in a social setting, but at work. If you place enough emphasis on valuing friendships, relationships, treating people well, you will get all sorts of opportunities. These opportunities could be simple business work, working in their companies to get a start up. And these opportunities will keep coming. I realize at the end of the day, you must be a person that have pretty good EQ, soft skills and decent work ethic. If you have that, you could move on from work to work easily. Having said that, I also hear my fair share of employers who tend to prefer the younger workers because they are cheaper, more productive, more malleable. Some people I know was able to work in certain field for a while. Eventually it becomes difficult to continue to work in the field because the management prefer “cognitively agile” individuals. This becomes a risk as you have not grown your wealth to a sizable amount that allows you to go into full retirement, and so you have to find some kind of work. One of the ways to balance purposeful work and life is to work on some things that you can identify with. 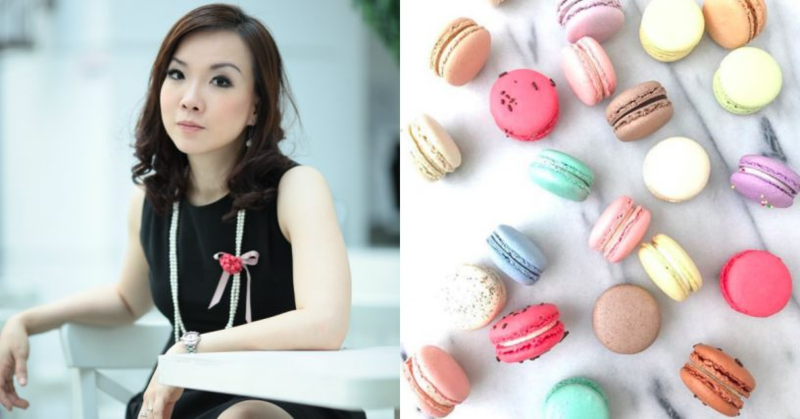 Annabella Sonwelly always have an interest in Macarons. She wasn’t born to do business. Wasn’t skilled to bake. However, after chancing upon a recipe, she decided to quit her 5 figure salary banking job and start Annabella Patisserie Trading Pte Ltd. Starting up a business is all work and no life balance, but to some, it is purposeful work that you can identify with. The amount of work you need to put in may vary. There are some form of business that gives you more balance between life and work. My friend James Yeo writes the blog SmallCapAsia. By day he is a financial analyst, by night he dishes tips on stocks, peer to peer landing, crypto-currency to investors who hopes to learn from his wealth of experience. He runs a subscription service over at community portal Investing Note, where he provides top stock picks for the low value price of $29. It may get to a point where he has build up his investment portfolio and a thriving investing recommendation business. For some, they could have more wealth built up, thus they can slowly incubate their business. I have a lot of friends who are freelance tutors. They teach different level of youths academic syllabus so that they can keep up with the classes or excel in subjects that they are weak at. 2 of them are Bully the Bear and My 15 Hour Work Week. There are years where you can see both of them vastly step up their earned income. ‘When you are a tutor you are an entrepreneur in your own right. However, you can step down as well. La Pap from Bully the Bear in the past year have a kid, so they have to step down the number of people they teach. The remarkable thing of both Bully the Bear and My 15 Hour Work Week is that both spouses are all in the freelance world. Not being in the medical field locally, I cannot comment much about the viability of part time work in local hospitals. However, it does look like a field of work where shifts and custom work arrangements can take place. In my short 2 year interaction in the hospital, I do encounter much consultants, specialized roles, doctors who are there only on specific shifts. Perhaps not locally, but doctors in USA have significant suicide rates due to burn out and the things that they see. The short holiday do not allow them to recharge adequately. The medical field is one where they start of being in school longer, have a large student loan debt but much higher salary. Thus, it is also a vocation that you have to vary the personal finance template. Due to the high stress environment, it might make sense for some to consider part time work. The reasoning is that part time work is possible, and still consider quite a decent amount of money if you keep your annual expenses in check. For some template, the part time work includes you saving money and building your wealth for greater security, towards financial independence. This might be a little different from the narrative I put out today. Still everybody wins, because you as a physician is happier, the hospital gets to fulfill their requirements and have a higher morale staff. When you are engaged in full time work, many of your companies will provide a comprehensive healthcare plans that co-shares on hospitalization. You would also have benefits such as dental benefits, sick leave days. Under Ministry of Manpower laws, a part timer are entitled to 1 rest day per week if you work at least 5 days per week. The employer determines the rest day, which can be Sunday or any other day. You are also entitled to paid public holidays. You are entitled to paid sick leave if you are covered by the Employment Act and you have completed 3 months of service. In summary the benefits are lesser. This means that you would need to take care of your own hospitalization insurance instead of relying on your company. A lot of people have reservations whether their money would last if they do a full scale retirement. There are ways to test it out. Instead of slowly transiting to semi retirement, you can practice living off 50% or not using 100% of your earned income. In this way, it is as if you do not have income coming in, you need to set aside money to use for your annual expenses. How would your wealth have done? How would you have coped psychologically. Semi-retirement is perhaps what many are looking for, but realistically it would work out if you take some years to plan and transit to a vacation that is conducive for this. Are you aiming for such a financial independence scheme? Or are you already in the semi retirement mode? Do share with us your experience. You can check out my other in depth discussion on financial independence and retirement planning over here. From my experience, it is quite easy for doctors in Singapore who want to coast, due to the still-controlled nature of limiting the numbers of qualified doctors by SMC. I would say much easier to coast or work part-time as doctor compared to other certified professionals e.g. lawyer, architect, CPA. E.g. many polyclinics depend on locum doctors. They are paid at least $100/hr & higher on Sat; i.e. just working 5 hrs a day from Mon-Fri will net them $10K a month. However polyclinic work requires hitting minimum targets of patients & can be hectic — some doctors work thru lunch in order to hit targets & knock off earlier. Many GP clinics also depend on directory of locum doctors. Work is less hectic compared to polyclinics. However paywise may be lesser. Frankly, for many MOs & consultants working in public hospitals, just getting out & working in clinics & avoiding the shift duties / weekend & PH duties / on-call & standbys is already a big coasting for them! The biggest obstacle for doctors in S’pore to coast is family pressure & peer pressure. E.g. expectation to continue providing “best quality” life for children / spouse / elderly parents, lifestyle inflation, already servicing landed property mortgage, unwilling to step-down “quality of life” etc. Hence in “Asian culture” S’pore, even if doctors want to coast, it’ll be more of the female ones especially those with young kids. Hi Sinkie, thanks for that perspective. the peer pressure one is real. even if you are a scholar choosing to be intentional about your life, you will have to get past the school and peer gatherings.